It's looking a lot like Autumn in my part of the world! We always hate the words 'Autumn Chill' uttered by the weather forecast people on TV...usually in August!! We have had beautiful Indian summer weather for most of September but I seem to have missed it all...who wants to travel in September!! 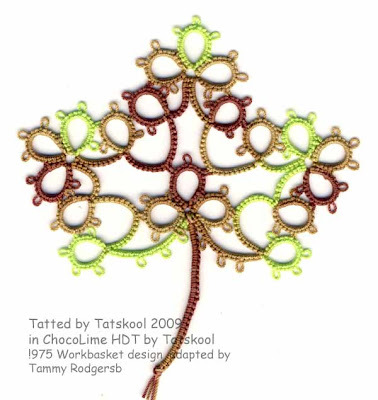 So my thoughts have turned to tatting leaves...something that I have never done before. 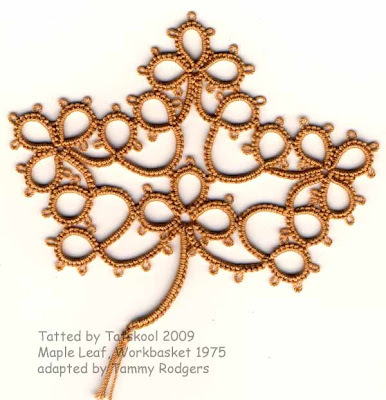 The pattern that I have been intending to tat for a long time is the Maple Leaf from the February 1975 Workbasket which has been adapted by Tammy Rodgers to include a stem. I tatted it first in a deep lime green Coats 20 thread...the one I used for the heart with the blue beads that everyone liked! It's quite a dull green. The leaf took a total of 8.5 metres, 6m on the shuttle and 2.25m on the ball. 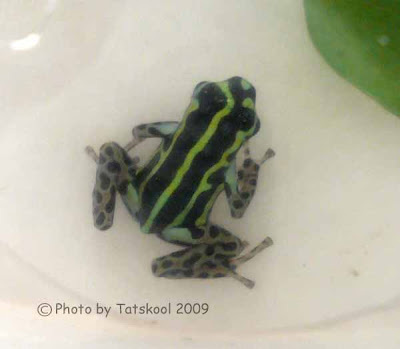 It measures 8.5cm (3.5in) across. ...another dull colour. Not a lot of life in these leaves, now what shall I tat them in next to add a bit of life.....Now I know that it seems obvious now, knowing what you know.....but it suddenly hit me...ChocoLime of course...I had been wondering what the role of this thread was going to me...silly me it was obvious even to a nit wit!! Now this was the point when I fell in love with ChocoLime...for certain! In size 30 this took 7.25m, 5.25 on the shuttle and 2m on the ball and measures 7.5cm(3in). 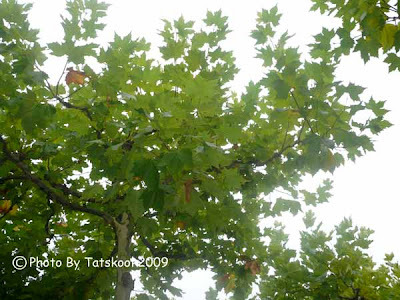 Tried another leaf..this one is a five point Canadian Sugar Leaf Maple designed by Gale Marshall. 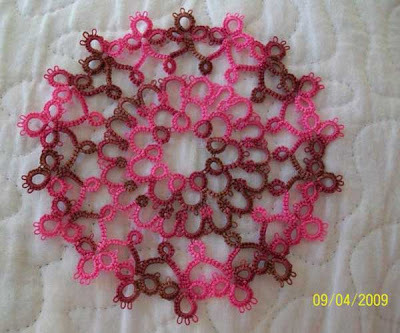 Another great and easy pattern. In size 30 this took a total of 13m, 9m on the shuttle and 4m on the ball. 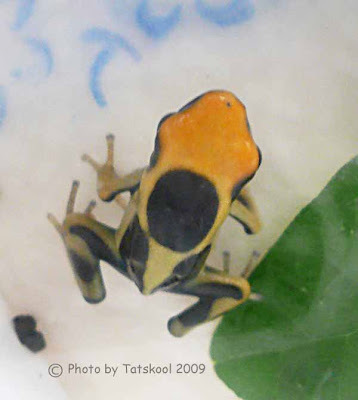 It measures 8.5cm(3.25in). I have only tatted this once so far but i should go back and make different versions. 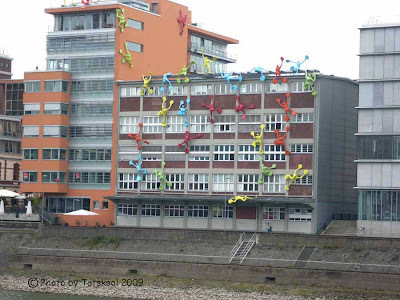 It was at this point that I went to Germany armed with thread and shuttles! I couldn't stop looking up at the trees. 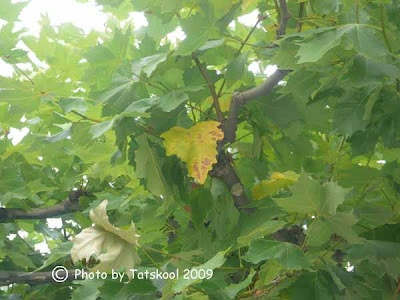 So many of the streets were lined with Plane trees...Platanus..so very like Maples. 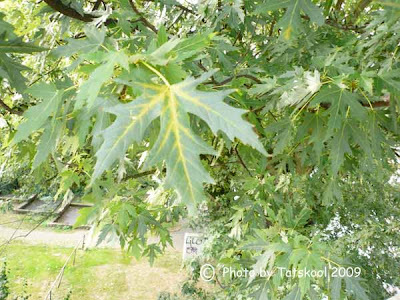 It's not an urban tree that we see a lot of. If I wasn't looking up at the trees, then I was looking at the ground...more about that next time. So did they look like my leaves...the answer was ..not a lot! So maybe I should try tatting with a solid colour for the veins. 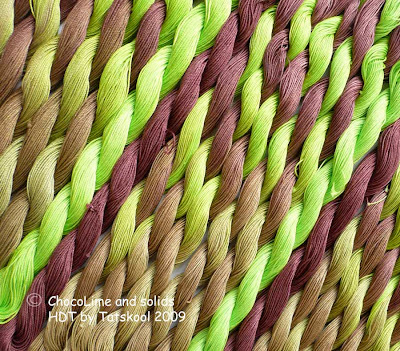 This is ChocoLime with Key Lime for the veins, isn't that gorgeous. 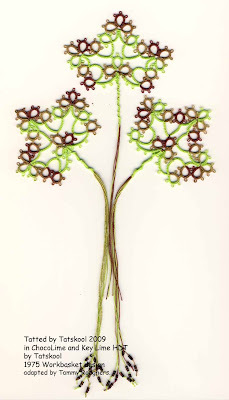 They make beautiful bookmarks, I left a long tail and added deep brown silver lined beads to each thread. One of the great things about this pattern is that you don't need to hide the ends. Adding an extra doubled thread at the end and tatting it into the tail,will give a tail with 6 threads. I have yet to try using Chocolate Sauce for the veins...just not enough time. When I got home I tried another different version along the ChocoLime theme. Dyeing as come to a halt while I wait for the disruption of installing a new fridge/freezer and tumble dryer in my 'Dyeing Studio'. I think keeping my dyes cold helps as when I got home and my fridge has died! I used up some dye from the week before (couldn't bear to throw it away) to make solid key lime and it washed out to a beautiful unrepeatable apple green!!! Had the most fabulous trip to County Sligo for my birthday...(not with good weather! ), if I ever get time I will blog about it. 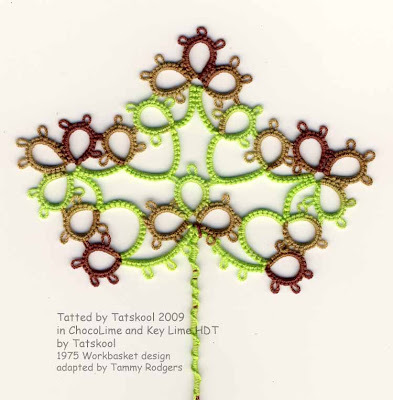 Yes ChocoLime has finally made it to this blog! 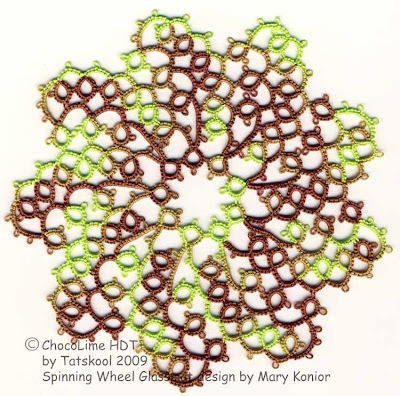 I had dyed a trial skein of 11 yards and tatted up Susan Fuller's Hearts Desire...yup like I always do, dyed a little more and made a Spinning Wheel Glassmat(by Mary Konior)..again like I always do now...they make such good reference tats. When I showed them to my friends I was amazed at the reaction...ChocoLime was their favourite!...so much for my colour tastes! I was supervising exams that month and like to tat in my lunch hour. 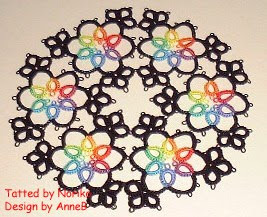 Nowadays I always take samples of my latest tatting to show anybody who is interested...and there is usually somebody. Well! this particular lunch time I was showing two friends(one male one female) who I have known for centuries...literally...must be 35 years or more. I had my three Hot Chocolate colourways...ChocRaspberry, Choco......, and ChocoLime. 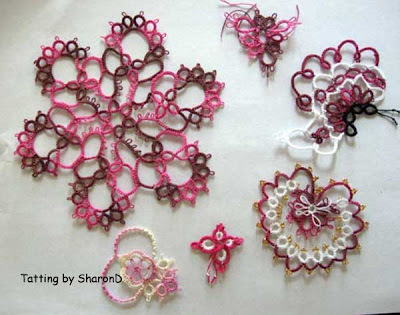 The fella who is always fascinated by my tatting has been having a really rough time. 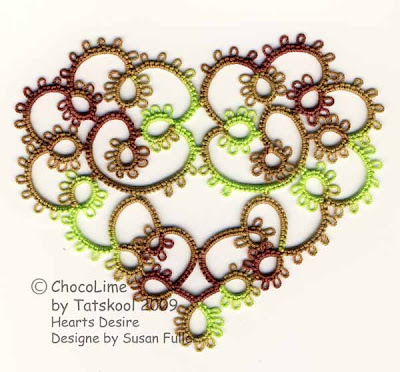 He has had one treatment...similar in nausea to chemotherapy and was going into hospital the following week for another........he immediately picked up the ChocoLime Heart and said..."that's my favourite". I don't do spontaneous things like that! Well, his eyes filled up with tears and he said that he would take it into hospital with him as a good luck charm. So my sample heart was gone to a good home.....and it wasn't until a few weeks ago that I decided to dye ChocoLime again. I think it's kind of Halloweenish...well it's the nearest to a Halloween thread that I am going to make this year. Yes I know you are dying to see it! so I have to put you out of your misery. But first I have describe this luscious new dessert to you. At the bottom of the sundae glass we have a generous helping of Lime ice. This lime is of my own making and is I think a stunning colour, it's very, very bright. 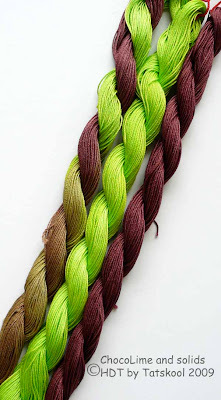 I have since bought a ready mixed lime dye and it's nowhere near as gorgeous as my mix. On top of the lime is a mousse of lime and chocolate and it's all topped with chocolate sauce. It's all very harmonious...I think. Now has that made you mouth water again??? I will be very interested to know how many of you like this colourway, do please leave a comment, they all help. Now this bit is really funny. 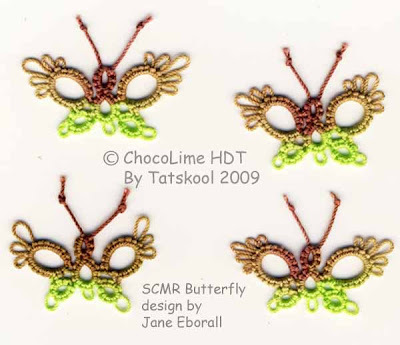 If I have a metre left on my shuttle I always tat a SCMR butterfly of Jane Eborall's design. These 4 little butterflies were all made with bits of left over thread...all started in a random point in the colorway..not selected...the start points of my skeins are always random. I couldn't believe how they could all have turned out so similar with the lower wings all lime!!! 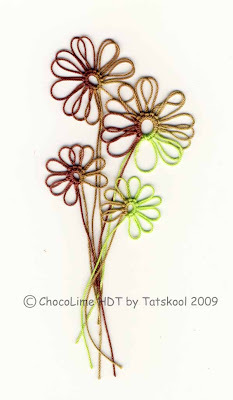 Less than a metre left and I tat little flowers...here is a ChocoLime bouquet. 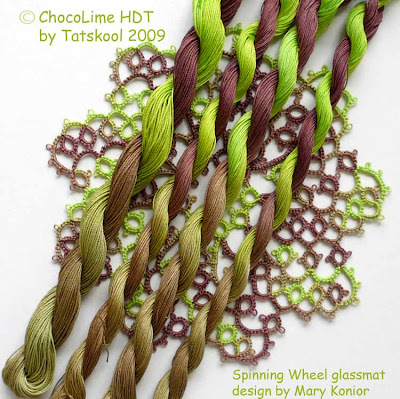 ChocoLime goes perfectly with Chocolate Sauce that I dyed before and with a new lime thread that I am calling Key Lime. This is what the new skeins look like. I am not sure if the colours are looking true or not. You must be getting bored by now, but before you go, I did dye one more trial in this colourway. 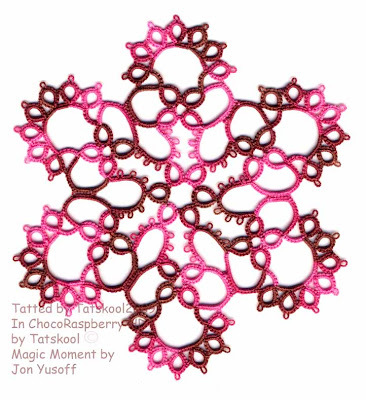 It's the equivalent of the Raspberry and Chocolate Mousse in ChocRaspberry...that is....it's ChocoLime but with out the extremes of Chocolate and Lime. 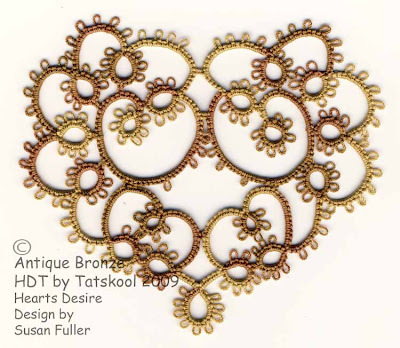 The skein looked pretty dull and boring but when I tatted it up into Hearts Desire..it's actually pretty cool! It's got a sort of dull glow to it...does that sound odd. I should call it Lime and Chocolate mousse but it looks nothing like that so I just have to call it Antique Bronze..that's a perfect description. I haven't dyed any more of this but it fulfills one of my early reasons for dyeing my own thread and that was to dye animal colours. I can see lots of animals tatted in this. So what do you think of all this. 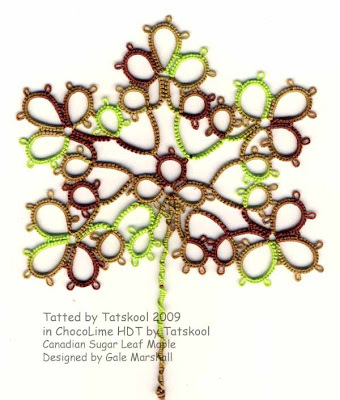 More next time of what I have also been tatting with ChocoLime. 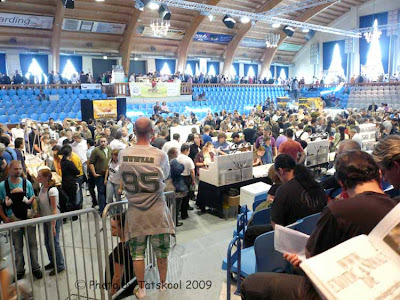 You will of course remember...if you are an avid reader of my blog....which I am sure you are....our trip to Germany in May to the Gecko fest. So a sucker for punishment I agreed to go again...this time to the gigantic Reptile Fair....this time on the condition that we had a holiday and actually saw something of Germany! We set off from home...leaving our car behind...no car parking problems...to use our free public transport pass as much a possible. Of course this added considerably to the length of the journey...well maybe not as we didn't have all that waiting around at another airport. We counted off the stages we had successfully maneuvered....wait for the bus with the luggage in the pouring rain as expected while hubby took the car back and ran back down to the bus stop. Bus on time, train to Dublin on time (trains are great for tatting on), airport bus on time, flight on time and our hire car was waiting...phew. 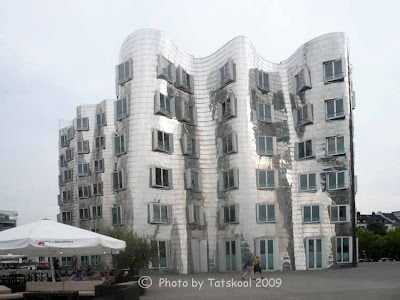 Sat-nav-lady located the hotel in Dusseldorf.... well near enough...she thought. Given key to the underground parking but incapable of understanding instructions to find it somewhere along a side street,and unlock the entrance due to our lack of German and receptionists lack of English!!! Several hours (well it seemed like it), aha! found it. Parked car and attempted to exit said underground car park.....but the mesh grid refused to go up and we were trapped...maybe for the night!! Shouted loudly ..'can anybody hear me!! ', didn't expect anyone would but a lady did and trotted off to the hotel to bring back the receptionist who couldn't open it either and didn't really know what to do. Off she went to get more help and while she was gone suddenly it worked and we escaped to have a comfy bed for the night. 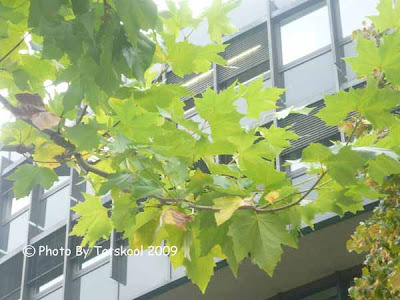 I did spend a lot of time peering up into the rows, and rows of Plane trees taking photos of the autumn leaves but that's for another time. 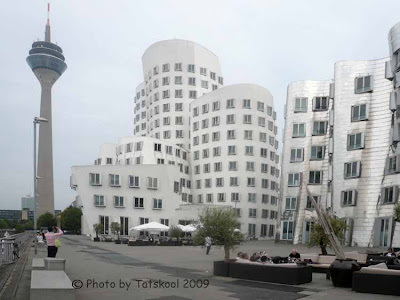 We found it hard to find out the delights of the Rhur that we should see, spent a day in Essen with another fabulous shopping mall...and then had to trick the sat-nav-lady into taking us on country roads not motorways to see rural Germany. Finally we arrived at the Reptile Show. Stallholders were setting up at 7am and by the time we found the place at 9am the car parks were full and the queues were horrendous. 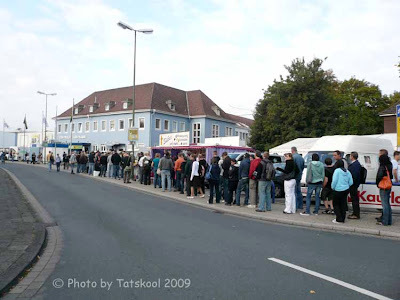 This photo doesn't really give you much idea as the queues went off in all directions. Finally at 10am we were in..together with the rest of the world it seemed...a very popular place to be. Really wouldn't want to be claustrophobic!! I don't know how the Repltiles stood it! Wow! 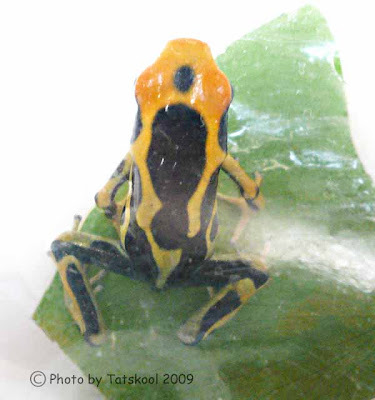 was there some stuff, snakes by the million, lizards, geckos, chamaeleons, frogs by the score, lovely lovely tree frogs...some so so tiny. They were my favourite this year. These little fellas were only about an inch long. 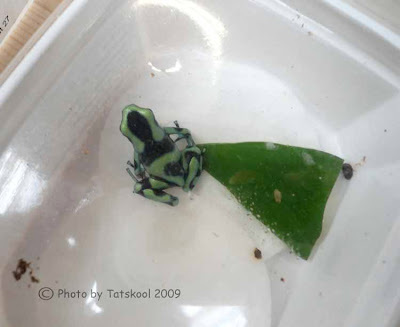 The photos are not all that great as they were taken through the lid of a plastic box! ....isn't he just something else! 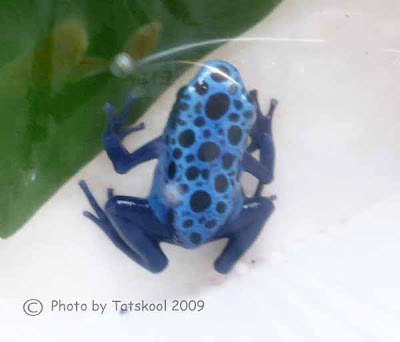 He is like a little tatted frog! 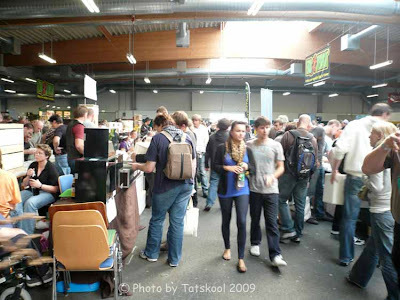 When we were exhausted after walking past every table in the big hall there was yet more, there were stalls in every available space. This was a great place to take a rest and people watch...never two the same! 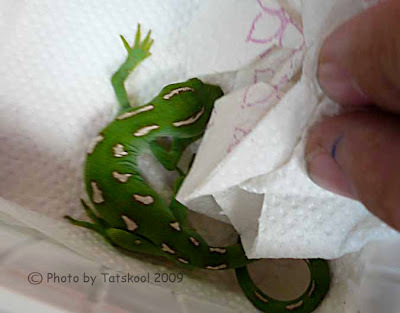 to be partners for lonely geckos! 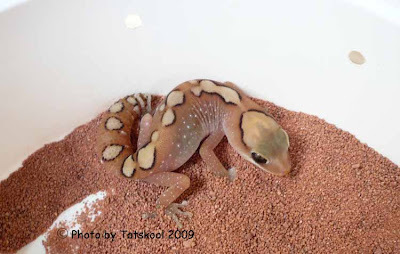 ......isn't he gorgeous, now you see why I like to tat geckos. I could go on showing you photos all day.....the chamealeons....my favourite reptile, tortoises, turtles...and then there were insects....mantids, stick insects,leaf insects...arachnids....shudder! ....this may all sound gross to you, but never underestimate the huge role these enthusiasts play in the conservation of so many species. We made it back home despite being unable to find the return hire car park at the airport...sat-nav-lady did not help enough!! The flight was delayed by nearly two hours along with 25 other flights all wanting a take off spot. Missed our train by 10 minutes, but thankfully the next one was a fast train and we caught the bus home ok.
Public transport gets a big thumbs up! 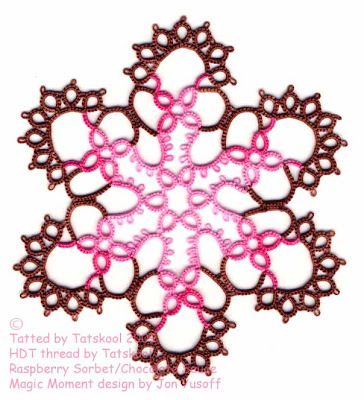 Unfortunately I went down with flu within a day of arriving home...so all tatting and dyeing are only just coming back into focus! Would ya believe that while we were away the old fridge/freezer that I keep all my dyes in had died/dyed! I don't know if I really need to keep my dyes cold, but it's a good place to keep them anyway. Oh! and the weather was so warm in Germany...it was bliss...turned out that summer came here while we were away too...typical! 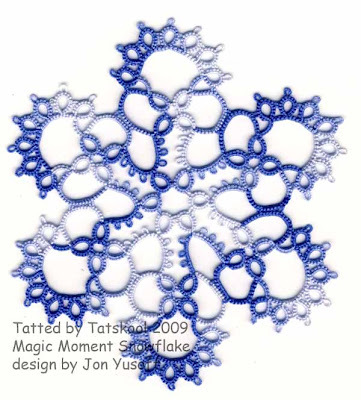 If you haven't already tatted Jon's Magic Moment snowflake then you have missed out on a fabulous pattern. You can find the pattern here. 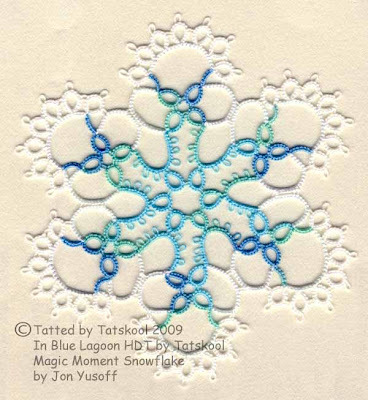 You already know that I am addicted to Jon's patterns...didn't I tat her entire Snowflake collection in Rainbow Bright last Christmas! The first thing that I did with her pattern...something I often do was to enlarge the diagram until it filled the width of my page. My trial tat was with a plain colour Flora 20...a gorgeous poppy red. It measures 12cm. As I was tatting I coloured in the diagram...using 2 colours to represent the actual colour that would show....not which shuttle to use...if you get my drift. This showed me what the design would look like in two colours...and it made following the diagram a lot easier too. If you do this then the pattern becomes easy. Next attempt was in a varig Altin Basak 50. It measures 10.cm. This one doesn't look quite as pretty in real life! 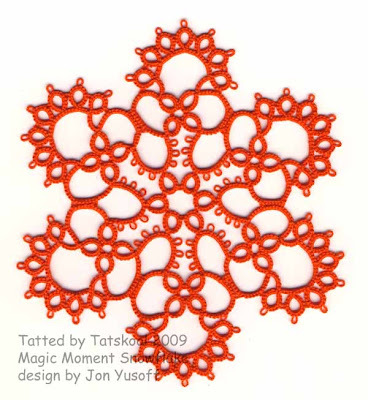 Now for some fun tatting. I had been fascinated by the stained glass effect that was being achieved by using a black outline and in some cases my Rainbow Bright...I think I already showed you one. But did you see this one tatted by kuc in japan. This was tatted using the itty bitty sample that I sent her. This is Magic Moment in size 40 in my HDT...I even had to dye black in 40! This measures 10cm too, the same as the Altin basak 50..
One of my friends used my Blue Lagoon and white as I had seen this combination used to good effect..so I had to try it too. This is size 60. 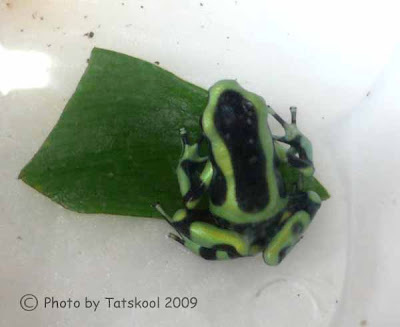 It measures just over 9cm and is more snowflake size. It looks really pretty. It would look divine in size 80. Look nice on a black background, but doesn't look as dainty as it really is. .....looked good enough to eat so of course I had to tat one..or two as well!! Size 20 thread. ...and it's yummy! size 40 thread. Thread amounts...size 20 takes a total of about 20m, 40 takes about 14.5m in total. Oh! by the way another yummy Choco Dessert is almost ready to come out of the cupboard. Keep watching!! My daughter can tat....but it really doesn't light her fire! well not often anyway. She learned a long time ago and hasn't forgotten how to do it...one day maybe she will pass it on. 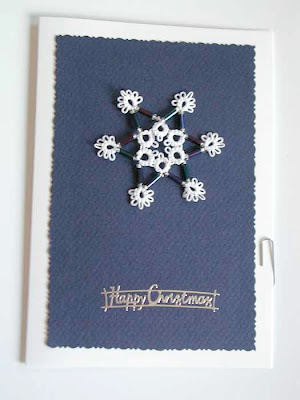 Her favourite design was my favourite very simple pretty generic beaded snowflake. 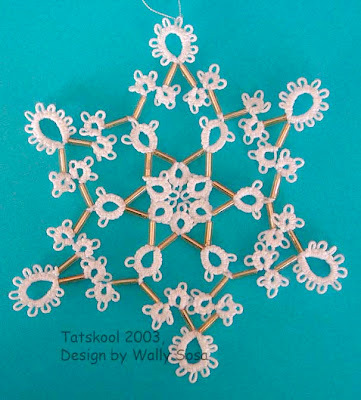 I think that the original inspiration was from the center of a snowflake by Wally Sosa. Please correct me if I am wrong. I have made so many of these in so many bead combinations. 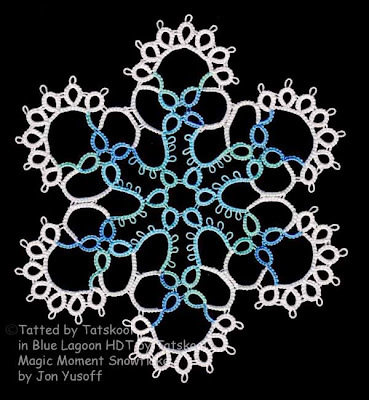 Way back in 2004 she tatted this snowflake for all of her Christmas cards and made a beautiful job of them. Having perfected this pattern she didn't want to learn anything else! She really didn't have time anyway. Occasionally she comes back to do a bit more....like the split ring snakes which she loved. Well who wouldn't!! So where is all his leading?? This summer she asked if I had a pattern that she would be able to do! The brief was that her Canadian friend is getting married in October. The theme is halloween and the bridesmaids will be wearing burgundy and orange. She wont be able to go but would like to make something for the wedding.....something for the bridesmaids to wear. Perfect I thought. 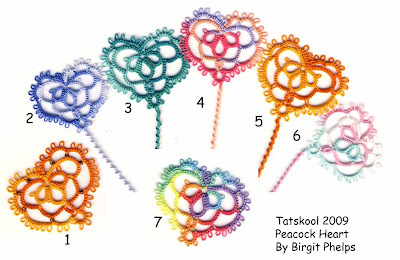 The pattern is Peacock Heart by Birgit Phelps and just been working on it and had made several. 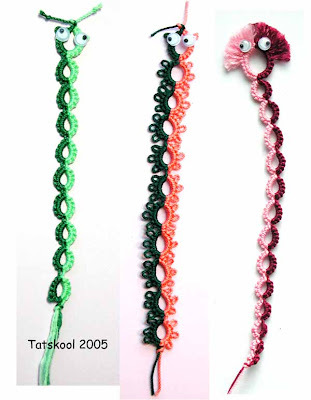 The long spiral tails with a matching clover end made them into pretty bookmarks. All except No 7 were made with Altin Basak or Oren Bayen 50, very pretty but rather soft, 3 cord threads. I didn't like the beaded version all that much. 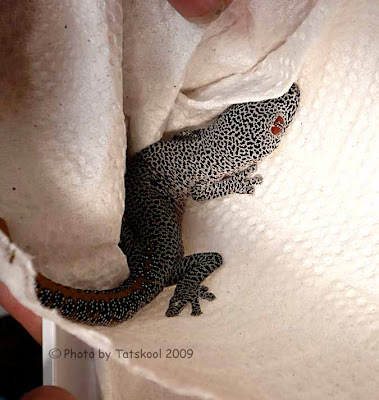 They take about 3.5 meters in total plus about 2.5 m if you want to make a tail. In size 20 thread they will take just a little bit more. 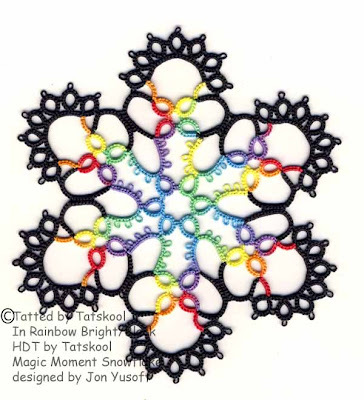 No 7 in tatted in my HDT Rainbow Bright. Back to the story......... she selected a dark redish colour and started to tat....and that's where I made a fatal mistake!! 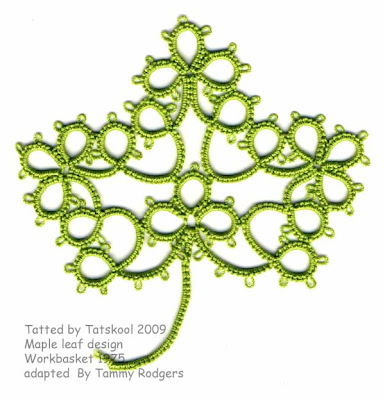 I suggested she tat them in right side wrong side tatting...little realising how that would throw her without any practice...........turns out she HATES tatting chains and this pattern after the central clover is ALL chains! Finally I talked her into letting me tat them for her as she really didn't have the time...and she could turn them into necklaces. So a couple of weeks later I sent her a little package.. So I hope her friend will like the resulting necklaces. When I got home from the dentist...ouch! what was waiting for me in my porch but Jon's book....yipee! If you haven't seen or heard about this book yet I have to tell you that it's a little cracker. The designs are so unusual, it must have taken her ages to come up with the ideas. They all have the most beautiful names too. Jon and I are having a little swap of her book for my thread and I am over the moon that she agreed to my suggestion. Hope she will be too. 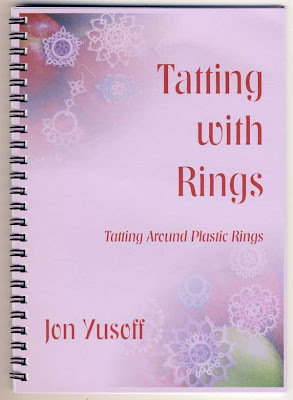 But, but, but that's not all that she sent......attached to the front of the book was a little plastic bag.......... and inside the bag was the most beautiful pair of tatted earrings that I have ever seen.....and they were even tatted in my very own Coral Reef thread...now how cool is that!! 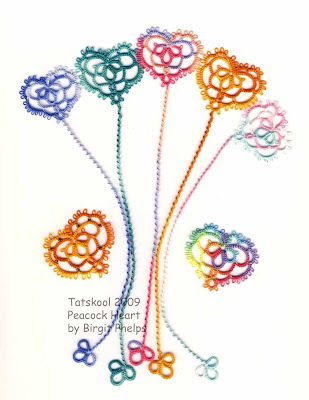 Well I had my tatting friends coming over the next day so I showed them the book and the earrings. They had already had a glimpse of the book and had wanted me to order it for them without knowing any more details. They all have Jon's Snowflake book and so knew how good this one was going to be. Now they want to know why their copies haven't come too!! So Jon has 5 more orders to fulfill!! 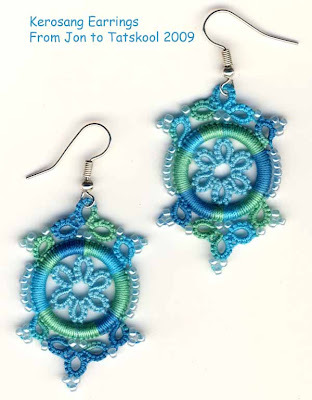 The earrings look much nicer in real life and I will wear them to the Lace Guild meeting tomorrow. Thank you Jon you made me one happy bunny.